SERIOUS WARRANTY ON THIS STUNNING 2016 CHEVY SILVERADO Z71 LTZ 4X4!! READ CAREFULLY: THIS BEAUTIFUL 2016 CHEVY SILVERADO CREW CAB LTZ Z71 4X4 COMES WITH A LIFETIME ENGINE TRANSMISSION AND FULL POWERTRAIN WARRANTY AT ZERO COST TO YOU!! WOW is an understatement!! Look at this 2016 Chevy Silverado Crew Cab LTZ Z71 4x4 that just arrived here at Hometown. 47k miles loaded too with navigation, heated and cooled seats, moonroof, remote start, Bluetooth and so much more. Clean Carfax and speaking of clean, this truck would pass for a brand new truck inside and out. This truck had a sticker price of over 52k dollars, so you can save thousands!! Make the short drive to Hometown and see why we were just voted Best Dealer to purchase a pre-owned vehicle from in Central Alabama. We offer bank and credit union financing here at the dealership with ZERO DOWN and LOW Credit Union rates, so you can drive this Silverado home today. 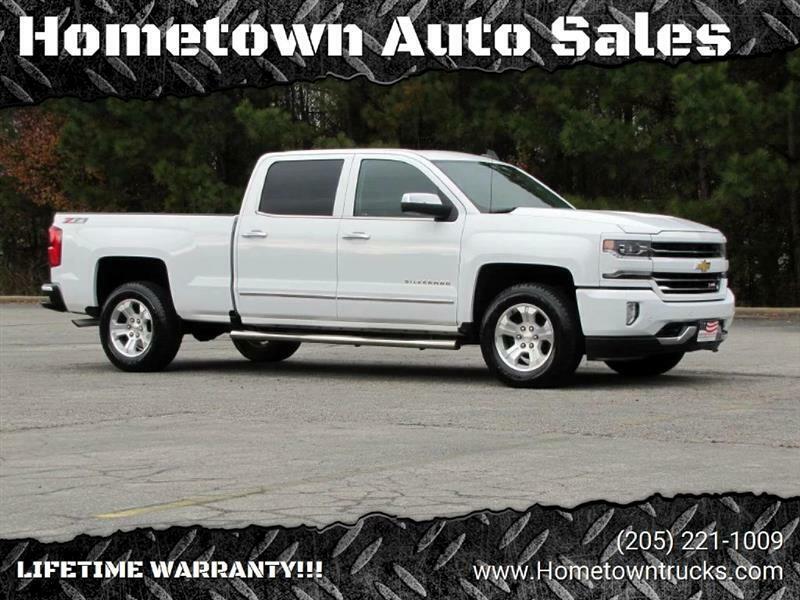 Also, for that added peace of mind that comes standard here at Hometown remember this: THIS 2016 CHEVY SILVERADO CREW CAB LTZ Z71 4X4 COMES WITH A LIFETIME ENGINE AND TRANSMISSION WARRANTY AT ZERO COST TO YOU!! NOT A 30 60 OR 90 DAY WARRANTY...... A LIFETIME!! Call Ed at 205 275 9754 or Roger at 205 522 8345. You can reach the office at 205 221 1009. Thanks! !